A new tropical depression will likely be classified by later this afternoon. A recon is scheduled to be on site at that time. The first visible satellite images confirm that a circulation is well established. Quickscat satellite shows only partial data , however enough of the data is present to deduce that a circulation is now all the way down to the surface. Deep convection is building rapidly on the north side of the circulation and the National Hurricane Center may need to skip the tropical depression phase and go straight to tropical storm Ida. At 8 am est / 7 am cst the tropical disturbance was centered near 11 N / 81 W or about 170 miles east of the Costa Rica and Nicaragua border. Top sustained winds are estimated near 35 mph and increasing. Forecast models are a bit ambiguous not picking up this system very well. At first glance for what it's worth, they drift the system toward Nicaragua and Honduras the next couple of days. A note of caution - until a tropical system has formed and the forecast models know it, data can be suspect. Interests in the western Caribbean should keep an eye on this system. 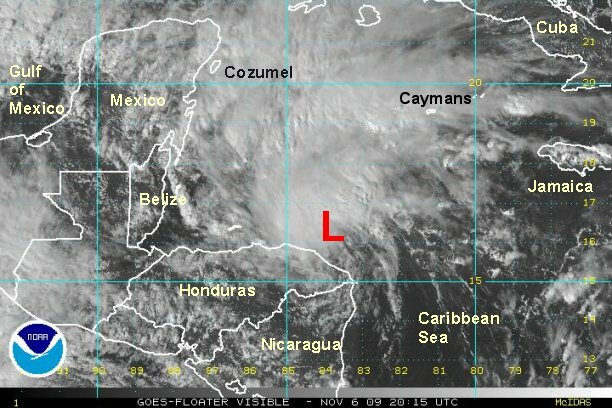 NHC classified the system at 11 am est. 35 mph. They should name it Ida later today when recon gets there. The system in the southwest Caribbean will be refered to as Ida, since it has been a tropical storm for several hours now. NHC will definitely upgrade soon. The recon reported a flight level of near 50 mph and winds are increasing. The banding and overall structure is looking more impressive, but Ida will soon make landfall stopping all development. 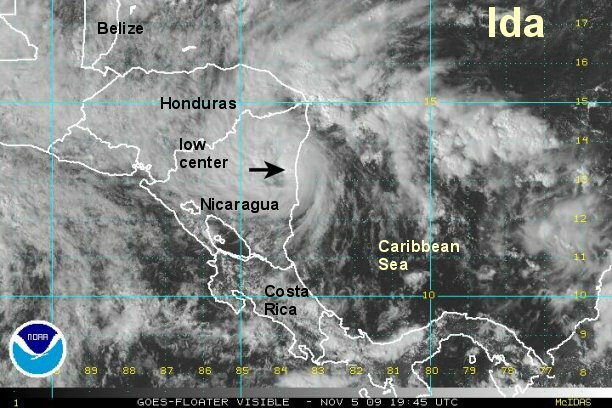 At 3 pm est / 2 pm cst the unofficial tropcial storm Ida was centered near 11.9 N / 82.6 W or about 75 miles east of the Costa Rica and Nicaragua border. Top sustained winds are estimated near 50 mph and increasing. Ida is moving northwest toward the eastern coast of Nicaragua at about 9 mph. 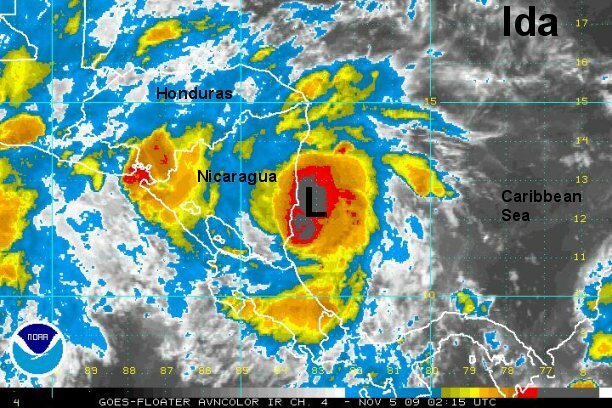 Forecasts take this system into Nicaragua and Honduras where it will weaken. It is forecast to move into the northwest Caribbean then southern Gulf in several days. Forecast models stall then weaken it there. Interests in the northwest Caribbean and southeast Gulf should watch the system carefully. Ida's strengthening will be ending soon as landfall is about to occur. Some wind gusts to near hurricane force are possible. The greatest threat the next few days will be flash flooding and mud slides where large amounts of rain - 10-20" or more may occur. Ida will likely strengthen again once moving north of Honduras in the next 1-2 days. At 11 pm est / 10 pm cst tropcial storm Ida was centered near 12.5 N / 83.1 W or just offshore of the Nicaragua coast. Top sustained winds are estimated near 65 mph ( NHC 65 mph). Ida is moving northwest at about 7 mph. Ida is on the eastern coast of Nicaragua bringing flooding rainfall. Winds are now coming down as the tropical cyclone is interacting with land. Flooding and mudslides continue to be the top concern with Ida. Ida will weaken while over land, but regain strength as it moves over the northwest Caribbean Sea east of Belize in the next 1-2 days. 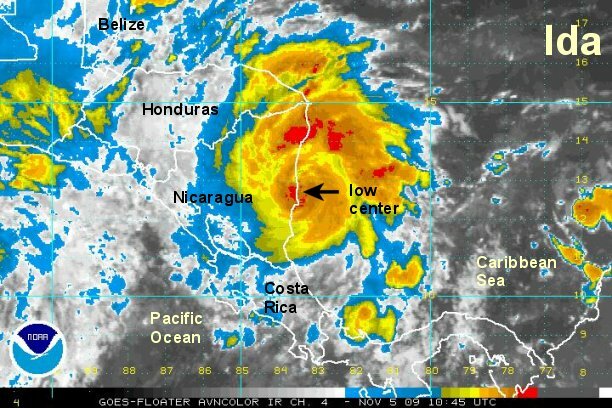 At 6 am est / 5 am cst tropcial storm Ida was centered near 12.9 N / 83.7 W or on the easten Nicaragua coast. Top sustained winds are estimated near 55 mph (NHC 70 mph earlier advisory). Ida is moving north northwest at about 7 mph. Latest forecasts take Ida over eastern Honduras then into the northwestern Caribbean Sea. From there Ida may enter the southern Gulf of Mexico early next week and drift into the southeastern Gulf where weakening is forecast at that point. Interests in the northwest Caribbean and southeast Gulf should watch the system carefully. NHC upgraded to hurricane strength (75 mph) at 7 am est. We're not feeling this - our estimate went down based on cloud top warming. We're sticking with 55 mph. Gusts could be 65 with sustained winds of 55 mph. With NHC's estimate, a 75 mph hurricane should have gusts to 90 mph. BTW, 70 mph looked reasonable during the early morning hours, but satellite is clearly showing a weakening trend. Ida has held together rather well today due to the proximity to water. The center of Ida is only about 25 miles inland with the eastern part of the circulation in the Caribbean Sea. Heavy rain with the threat of mudslides continues for eastern Nicaragua and northeastern Honduras. Our next concern will be restrengthening once Ida moves north of the coast of Honduras. At 4 pm est / 3 pm cst tropcial storm Ida was centered near 13.3 N / 83.7 W or just inland on the eastern Nicaragua coast. Top sustained winds are estimated near 50 mph (NHC 60 mph). Ida is moving north northwest at about 3 mph. Latest forecasts take Ida over eastern Honduras then into the northwestern Caribbean Sea. From there Ida may enter the southern Gulf of Mexico early next week. Forecasts take it into the open gulf about Tuesday or Wednesday, then take it south toward the Mexican Yucatan again as a ridge of high pressure builds over the eastern U.S. Cancan and Cozumel may need to dodge this system twice. The most recent satellite imagery shows heavy storms over the eastern border of Nicaragua and Honduras. No doubt flash flooding and mudslides have occurred. Rain will be slow to abate since Ida is barely moving at this time. At 10 pm est / 9 pm cst tropical depression Ida was centered near 13.8 N / 84.1 W over northeastern Nicaragua. Top sustained winds are estimated near 35 mph (NHC 35 mph). Ida is moving north northwest at about 5 mph. The forecasts have shifted on the latest run. Ida is forecast to move toward the Yucatan channel and maybe into the extreme southern Gulf before heading east across the northwestern Caribbean. This is a rare but possible scenario, which is usually observed late in the season when westerlies are pushing south. 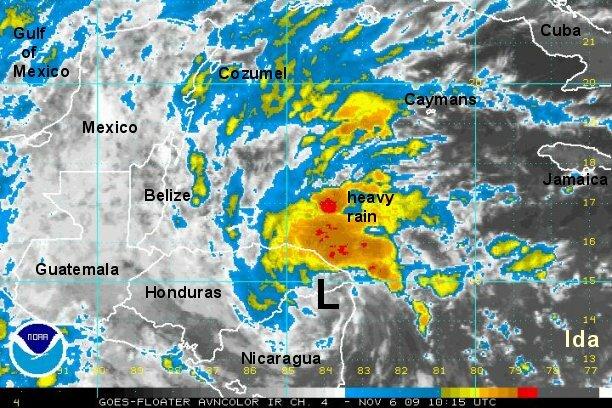 Heavy rains are shifting northward, with the bulk now on the coast of eastern Honduras and offshore. Cloud tops are cooling, a sign of the heavy storms expanding off of the coast. Ida still has some time over the rugged terrain of Nicaragua before emerging offshore. Any substantial development will not occur until the surface low hits the water again. At 6 am est / 5 am cst tropical depression Ida was centered near 14.6 N / 84.0 W over northeastern Nicaragua near a town called "Bonanza". Top sustained winds are estimated near 30 mph (NHC 35 mph). Ida is moving north at about 6 mph. The forecasts have shifted back to yesterday's scenario.. Ida is forecast to move toward the Yucatan channel by early next week then into the south central Gulf at about the latitude of south Florida or a little more north. After this it will be affected by a mid-latitude system that will shear it as it continues north or force it south again. The models are having a tough time with the latter part of the forecast. NHC mentioned that there is a wide range in the strength forecast by different models - from a hurricane to something much weaker. They are taking the middle road by keeping a restrengthening Ida as a tropical storm. This is a sound approach at this time since the models are all over the place. 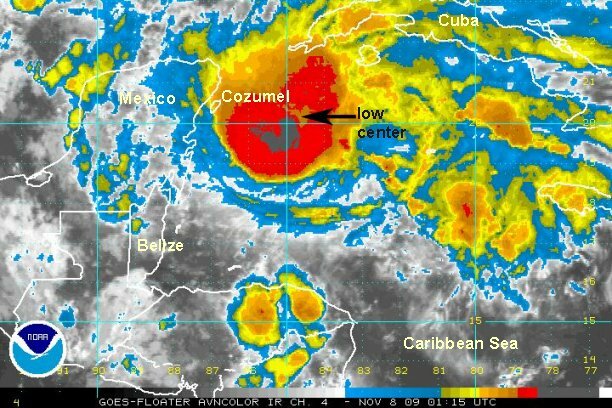 A large area of convection is growing in the northwestern Caribbean Sea. Rains are wrapping around the low heading toward the Bay Islands north of Honduras as well as Cozumel and Cancun. 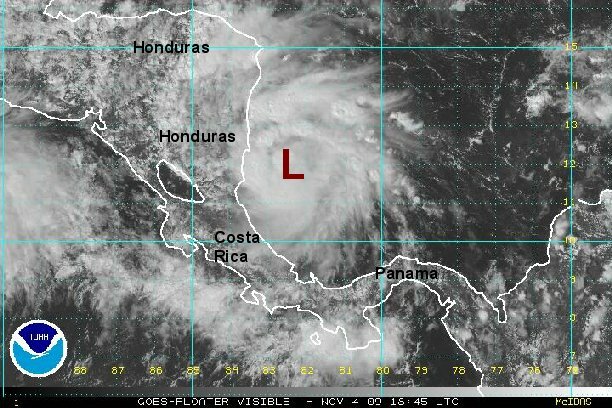 The low will emerge off of the coast of eastern Honduras in a matter of hours. Redevelopment looks to occur soon after. At 11 am est / 10 am cst tropcial depression Ida was centered near 15.1 N / 83.5 W or near the extreme eastern coast of Honduras. Top sustained winds are estimated near 30 mph (NHC 35 mph). Ida is moving north at about 7 mph. Ida is offshore of Honduras with heavy showers and storms multiplying. Ida will likely regain tropical storm strength later this evening. Unsettled weather now stretches from Cancun and Cozumel, the Cayman Islands to just west of Jamaica. 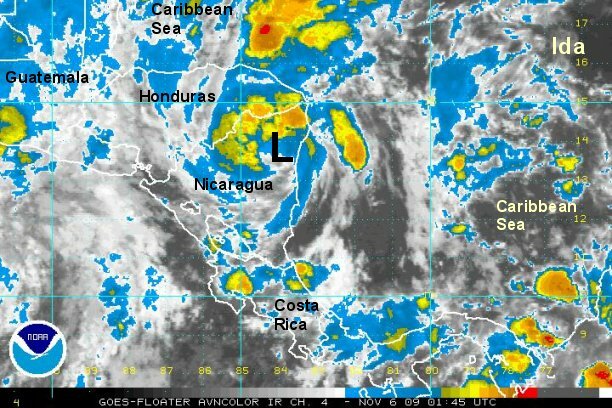 At 5 pm est / 4 pm cst tropical depression Ida was centered near 16.3 N / 83.9 W or about 50 miles north of the Honduras coast. Top sustained winds are estimated near 35 mph (NHC 35 mph). Ida is moving north at about 10 mph. Ida is forecast to move toward the Yucatan channel by early next week then north into the central or eastern Gulf by Tuesday and Wednesday. Ida will face increasing wind shear as it moves farther north. Regardless, a gradient wind will set up ealy next week bringing gusty winds to the north central and eastern Gulf. Seas will become rough from the combination of the gradient and the storm. Interests in the northwest Caribbean and eastern half of the Gulf should watch the system carefully. Tropical storm Ida is continuing a slow methodical trend for strengthening. This trend will likely stop over the next couple of days as Ida moves into a harsh shear environment. The low center is slightly to the southeast side of a growing burst of convection. For the immediate time slow strengthening will continue. Seas are currently about 8-15 feet in the northwest Caribbean. Seas will continue to climb in the northwest Caribbean from Ida. Over the next couple of days seas will build in the eastern and central Gulf of Mexico as a gradient wind sets up from Ida and a high pressure system. At 8 am est / 7 am cst tropical storm Ida was centered near 17.7 N / 84.1 W or about 245 miles southeast of Cozumel, Mexico / 205 miles southwest of Grand Cayman. Top sustained winds are estimated near 45 mph (NHC 40 mph). Ida is moving north at about 8 mph. The consensus forecasts have Ida doing a "backwards" question mark over the next few days. Ida is forecast to move through the Yucatan channel during Sunday, then north into the central Gulf of Mexico. After this recurve slightly southeast and dissipating. Another scenario pulls Ida rapidly north into the Gulf coast near the Alabama / Florida border late Monday night. Wind shear will increase greatly as Ida moves into the Gulf of Mexico. The Hurricane Center is keeping Ida a tropical storm and following the consensus forecast. As wind shear increases,, it will modify the structure of the system either with it becoming sheared or extratropical as it moves into the central Gulf. Deep convection continues to grow indicating further strengthening. Also noted is cloud top warming over the circulation which suggests that an eye has formed. Because of this we now believe that Ida is a minimal hurricane. 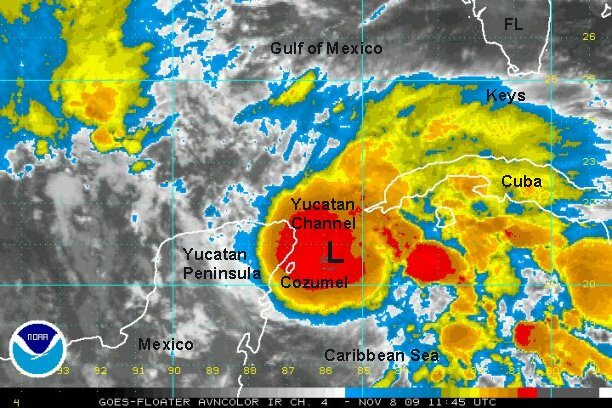 Thankfully, the worst of the weather is moving up through the Yucatan Channel. The heaviest rains will remain offshore of Mexico and Cuba. Seas now have built east of Cozumel to the 15-25 foot range under the deep convection with Ida. A recent buoy east of Cozumel had a gust to about 60 mph with 19 foot seas. At 9 pm est "tropical storm" Ida was centered near 20.1 N / 84.7 W or about 145 miles east of Cozumel, Mexico. Top sustained winds are estimated near 75 mph (NHC 70 mph earlier). Ida is moving north northwest at about 12 mph. Look for the hurricane center to upgrade Ida to hurricane status at 10 pm est. The hurricane center has adjusted their track with a modified backward question mark. As earlier stated, the consensus showed that Ida would weaken and hook southeast in the central Gulf of Mexico. Other models raced the low to the Alabama / Florida border. NHC's new track is a compromise between these solutions with their backwards question mark now in the northern Gulf of Mexico near the northwest coast of Florida. Wind shear is still forecast to be strong, weakening Ida as it moves into the central Gulf. Ida will likely become extratropical as it approaches the northern Gulf coast. 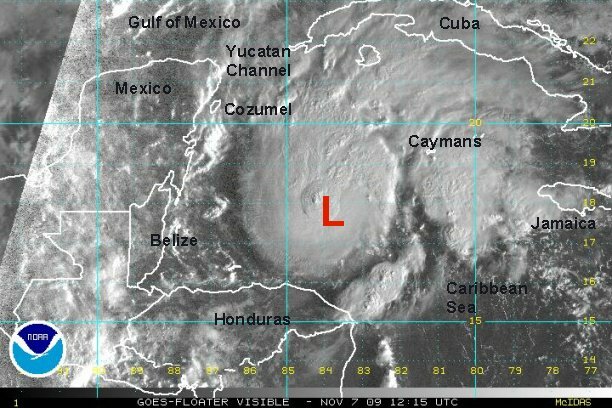 NHC is holding at 70 mph for the 10 pm est advisory despite an eye forming. Hurricane Ida is making its way up toward the Yucatan Channel today, making its closest pass to Mexico and Cuba. 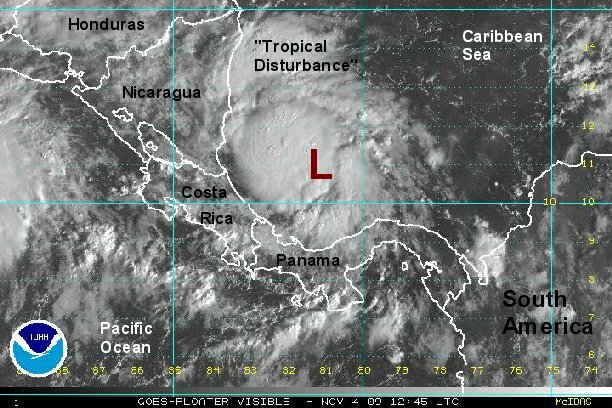 The worst weather will be on the extreme eastern tip of the Yucatan. Winds may reach the 50-75 mph range there if the northwest course continues. 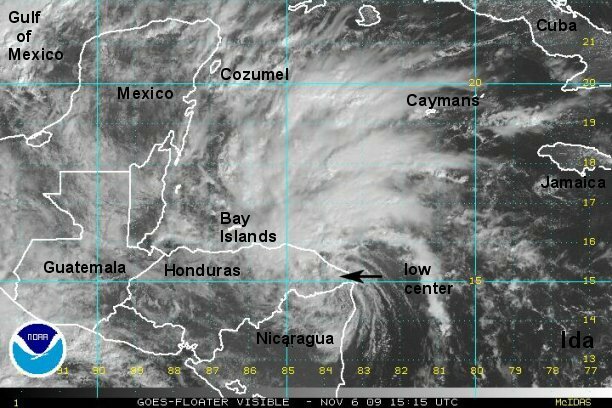 Cancun and Cozumel at first glance appear to be getting some rough weather by the satellite imagery. Recent surface observations indicate otherwise, with Cancun and Cozumel reporting rain and winds in the 15-20 mph range. A recent recon found a pressure of 983 mb. This is not terribly low for supposedly a 90 mph hurricane. A flight level wind of 85 mph was found. Flight level is usually stronger than the observed surface wind, sometimes significantly if the observation was at a high level. Because of this we will estimate top sustained surface winds at about 80 mph in a small area in the western eyewall. 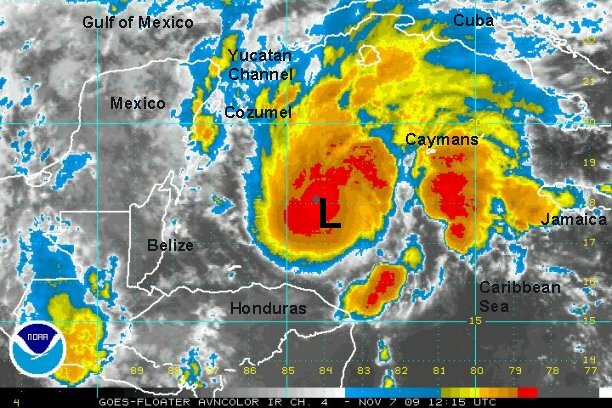 At 8 am est hurricane Ida was centered near 20.9 N / 85.7 W or about 85 miles east northeast of Cozumel, Mexico. Top sustained winds are estimated near 80 mph (NHC 90). Ida is moving northwest at about 12 mph. The latest forecast show Ida making landfall near the Alabama / Florida border Monday evening. As stated by NHC they are troubled by the spread of the forecast track later in the period. We agree with them that Ida should weaken significantly as wind shear increases and water temperatures get much cooler near the northern Gulf coast. This should mean that Ida will come in as an extratropical system.